Silkworms are proving to be one of the healthier choices for an insect feeder. Variety is always best when choosing a healthy diet for your favorite insect eating pet. Silkworms can be a big part of that choice. They are low in chitin. Chitin is the outside undigestable hard shell that most insects have. There 's no danger of impaction when you feed these to your baby Bearded Dragon. They have a higher percentage of protein and are low in fat. Silkworms have a lower percentage of phosphorous allowing your pet to absorb more calcium. They don't crawl away or infest your home. They don't smell and don't make noise. 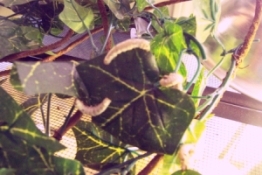 Silkworms do not need a lot of space and only minimal care. Even picky eaters like silkworms! NEW! 250 -$16.00 - packed in one cup NEW! 1000 - $40.00 - packed in two plastic boxes LIMITED AVAILABILITY! SILKWORMS and chow are available for PICK UP ONLY . No shipping at this time. Sorry! You may pick up your order at the MICHIGAN REPTILE SHOW in Taylor Mich! The shows are held the second Saturday of each Month. You may pick up silkies directly from me. I am located in South Eastern Michigan. Contact me at linda@jewelsdragons.com to make special arrangements!